A small change such as using a refillable water bottle instead of single-use bottles can save up to 150 pounds of carbon dioxide a year. 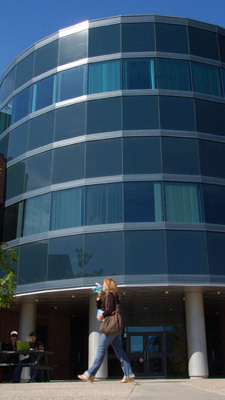 The UBC Okanagan Sciences building, shown here, has a water kiosk where students, faculty and staff can refill their bottles with clean, filtered water. Starting next Wednesday, UBC Okanagan students, staff and faculty will be challenged to take action to lower their carbon footprint. The UBCO go beyond Carbon Diet is designed to raise awareness of climate change and to encourage everyone in the campus community to make a difference through behaviors and actions. "Sustainability is about engaging people to change the way we make decisions and act," says Leanne Bilodeau, Manager of UBC Okanagan's Office of Workplace Health and Sustainability (OWHS). "Targeted programs like our go beyond Carbon Diet are an important start to help promote awareness and actions on and off campus that can have a positive impact." The Carbon Diet is being launched Oct. 21 by UBC Okanagan in partnership with the Sierra Youth Coalition's Go beyond program. Participating students, faculty and staff will evaluate their personal environmental impact from day-to-day activities such as choosing their modes of transportation, food choices, and water and energy use. By "losing" 5,000 pounds of carbon dioxide (CO2) emissions, participants will be entered to win a bike from Venture Gear, or a Big White season's pass. "We modeled this on similar projects that have been launched in the United States," says Mallory Hewlko, a work-study student with the OWHS who planned and is coordinating the UBC Okanagan Carbon Diet project. "We hope the short-term challenge will inspire long-term life choices." Once signed up, participants will be given a worksheet outlining actions they can take and how to calculate the pounds of CO2 they can "lose." Buying food that's in season saves up to 700 pounds of CO2, for example, and only using a dishwasher when it's full saves 200 pounds. Education and engagement sections allow participants to lower their carbon footprint be attending educational seminars provided by the Office of Workplace Health and Sustainability and also by taking part in current sustainability initiatives on campus or starting their own. UBC Okanagan's campus infrastructure and building designs reflect the university's sustainability commitment, says Jackie Podger, Associate Vice President, Administration and Finance. "In addition to encouraging individuals to reduce their own carbon footprint, we are committed to reducing our institution's carbon footprint through programs like our geothermal system," says Podger. "Approximately 80 per cent of all heating and cooling on campus is generated from low- to no-carbon sources." For more information visit the UBC Okanagan Office of Workplace Health and Sustainability website at www.ubc.ca/okanagan/sustainability.